Quality Carburetor Parts & Carburetor Rebuild Kits for Carter, Ford / Motorcraft / Autolite, Holley, Rochester, Stromberg Carburetors. QuadrajetParts.com is dedicated to supplying quality carburetor parts to help increase engine performance and improve your gas mileage. We maintain a large inventory of hard to find carburetor parts such as throttle shaft bushing kits, choke thermostats (divorced chokes, hot air & electric chokes) for easier starts and ethanol resistant accelerator pump assemblies, carburetor fasteners and idle mixture screws. We carry a large selection of needle and seats, metering jets, primary metering rods, secondary metering rods to help you tune your carburetor for maximum efficiency. We sell premium carburetor rebuild kits. That means ethanol resistant parts and carburetor gaskets such as accelerator pump cup that are of the highest quality available and include illustrated instructions for easy installation..
We offer a large selection of marine carburetor parts and marine rebuild kits at great prices. Other carburetor parts we sell are choke pull-offs, hard to find choke linkage rods, thicker premium carburetor gaskets to better seal your carburetor. Leaking gas line fittings? Our huge selection of fuel inlet fittings, self tapping gas fittings and o-ring fuel inlet repair fittings are available to seal and repair your leaking carburetor. 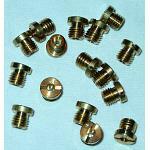 Checkout our site as we are continually adding new, NOS and used carburetor parts.